The Historical Society of Windham County was formed on August 23, 1927 “to stimulate interest of present and future generations in the history of the County and its several townships and acquire a more intimate knowledge of the methods, customs, hardships, and triumphs of our present ancestry.” The idea for a county-wide society to preserve artifacts related to Windham County came from Clara Chipman Newton, whose ancestors settled on Newfane Hill after the American Revolution. The organization was incorporated August 10, 1933. Once the Society began receiving artifacts, there became a need for storing and displaying them. 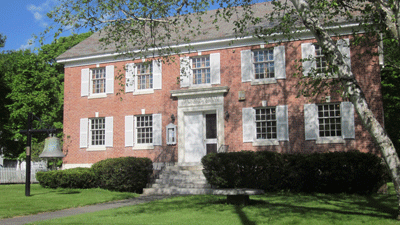 The Society members began a building fund and the cornerstorne of the present Museum was laid August 5, 1936. Since that time the museum has been the showcase of the Society’s work. The Society is managed by a Board of Directors and Executive Board. Besides preservation of the collection, the Society conducts several programs during the season between June and October, publishes a newsletter three times a year, and organizes and supervises a number of special projects such the bi-annual History Fair on historic Newfane Common. The museum is located on the main street (Route 30) in Newfane, one of the most picturesque villages in Vermont and listed on the National Register of Historic Places. As the Shire Town, Newfane is home not only to the Historical Society of Windham County, but the Windham County Court House as well as the Windham County Sheriff’s Department, both buildings dating back to the early 1800’s. “In the early settlement of the town, a village grew up on the summit of a hill, which rose like a cone in the center of the town, and in 1787 Newfane was constituted the shire town of Windham County, and the courts were removed from Westminster to Newfane HIll, so called. From 1790 to 1820, the village consisted of a court house, jail, meeting house, academy, three stores, two hotels, a variety of shps, such as were found in all New England villages at an early day, and about twenty private residences.